This is for you Rachel and her Team. Thank you both so much for the gorgeous message. I have sent everyone on our team a link to your presentation and I know that they are all going to feel so special when they read it. I particularly loved the poem on page 3. I've never had anyone write a poem for us before - thank you so much! We really hope that you are enjoying the programme. We're having a great time reading your posts and commenting on them! Please keep up the awesome work!!! 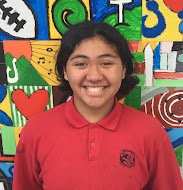 My name is Georgia and I am the cluster manager for the Kaikohekohe (Northland) cluster. Rachel shared this presentation with me last night and I was just blown away by the effort you both put into saying thank you. I have loved my job this summer and have had so much fun reading my clusters blog posts and commenting with so many students. I'm so happy to hear you both enjoyed the programme so much and I hope we'll see you getting involved next summer and encouraging your friends to join too. Thank you for such a lovely card, I especially enjoyed the awesome poem. My name is Allie and I am the cluster manager for the SLJ in Toki Pounamu on the West Coast of the South Island. Thank you so much for your lovely thank you card that the two of you have presented. You have made a great job of this. I am really enjoying reading the blogs of all the students that are taking part in the SLJ over the summer. It's great that you have enjoyed doing the programme and that you will be taking part again. That's just fantastic! Thanks again girls, keep up the great work!